We'll Never Be Apart by Emiko Jean. 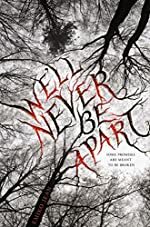 Review: We'll never be apart. The whole story revolves around this one line. It's a twisted and dark book that makes you keep reading it more and more. The book lures you in, makes you want to know what is going to happen at the end. What book am I talking about? We'll Never Be Apart by Emiko Jean of course. We'll Never Be Apart is about a girl named Alice that has been sent to a mental asylum called Savage Isle. There, she meets Chase, a boy who is just like her: broken. Chase and Alice become friends and Alice soon learn to trust Chase. Alice has found it hard to trust people ever since her boyfriend, Jason and her twin sister, Cellie, betrayed her. Chase helps Alice figure out who she truly is and helps her realize that the people that she loved the most were evil. Alice also writes about her childhood problems her and her sister faced in her diary. We'll Never Be Apart is a breath-taking book to read. But, make sure you're ages 12 and up because some content might be inappropriate for you. You also should make sure you are mature enough to handle this book because it will cover topics like murder and it'll use so-called "bad" words. If you're not ages 12 and up, ask your parents if you can read this book. While the story is taking place in the present, there are little excerpts of her childhood that help you understand the story more and help you connect with Alice's character. There are two "parts" or "tenses" in this story, so you need to make sure you are reading attentively because it's very easy to miss useful information while you're reading. We'll Never Be Apart is an amazing book that teaches you a lot of life lessons and morals. One of the morals was that you should never trust someone that easily or they might break you. Overall, this is a sterling book to read. We would like to thank Houghton Mifflin Harcourt for providing a copy of We'll Never Be Apart for this review. Have you read We'll Never Be Apart? How would you rate it?